About the Author: Carolyn Pachas is a Communications and Social Media Specialist, Blogger and English Instructor in Pennsylvania. She also takes flamenco dance classes at the Pasion y Arte Flamenco Conservatory in Philadelphia, PA.
Life is a long journey. The process itself is dangerous, exhausting, and full of happy moments, of sadness, full of rage, anger, and disappointments. Sometimes I believed in a supreme being, and like all of us, lost the faith, and gained it back again. I lost faith in humanity and in myself. Then through life experience, lots of reading, patience and observing people around me, I gained it back again. Flamenco is like life; it is divided into many aspects and goes in so many directions. It allows you to feel it, interpret it, and show your feelings to the outer world. What comes out of your heart, can be seen in any dance interpretation, but flamenco touches you to the core. I cannot say that I have had a wonderful time with my flamenco journey. It is different for everybody, and my experience had its dark moments. It could be related to the lack of time to practice, the long one hour drive twice a week to class, having only one flamenco school in the area, or work schedules that get in the way. One thing is for sure, I never gave up despite the circumstances, and my journey has been a positive one in so many other aspects, which is why I wanted to share it. The class is diverse, people of different ages and countries come in, new students come and go, and the class is always evolving. One thing I have noticed of our class is that every time there is a performance, people from the audience become intrigued, want to learn more about flamenco, and after a few lessons, they drop the class, others stay if they are passionate about flamenco, or have studied about it before. The best part is that you make new friends. You get to have a new family, and the bond is authentic and full of love. Even if you are an exercise or gym buff, ballerina or jazz dancer, flamenco adds another element to your mental understanding of what your body can and cannot do. First of all, I don’t have to emphasize how dance can improve brain function, I leave that to the experts like Christopher Bergland, who is a world-class endurance athlete, coach, author, and public health advocate. In an article written by Christopher for Psychology Today, he emphasizes on recent studies that show how different types of practice allow dancers to achieve peak performance by blending cerebral and cognitive thought processes with muscle memory and ‘proprioception’ held in the cerebellum. I can say that I used to have problems with keeping my balance and getting dizzy. Flamenco has helped me in keeping my balance, and now I don’t get dizzy with just a jolt of movement. Not to mention, my calves are strong like an athlete, and my ability to move out of the way in case of an emergency is off the charts. My agility is better, I can dance for longer periods of time, when I get out of class I am full of energy for the rest of the day, and my Ulcerative Colitis has hardly any effect on my daily life. Another component for your body is the fluidity and the fast increase of improvement in improvisational movement. Once you learn the steps and the rhythm, your movements become less mechanical. Our performance with Pasion Y Arte Flamenco, Philadelphia. I have never been afraid to be on stage. In fact, I love the moments when I am on stage and show what I have learned. I remember as a little girl, and even as a teenager, I always participated in school functions. So I never suffer from stage fright. As an adult now I have also seen in class women who were shy, or afraid, that after months of practice change into this outspoken, not shy person. I have seen how flamenco can transform people and give them a sense of accomplishment. Seeing women who were shy, grow into this powerhouse in front of an audience, is inspiring and contagious. Flamenco brings out the best in us, our ability to communicate with the world and speak a language that the heart of the audience can understand. I am very surprised when people in the United States do not know how to pronounce flamenco. “It is not Flamingo, it is Flamenco.” Flamingo is a pink bird, Flamenco is a Spanish dance. 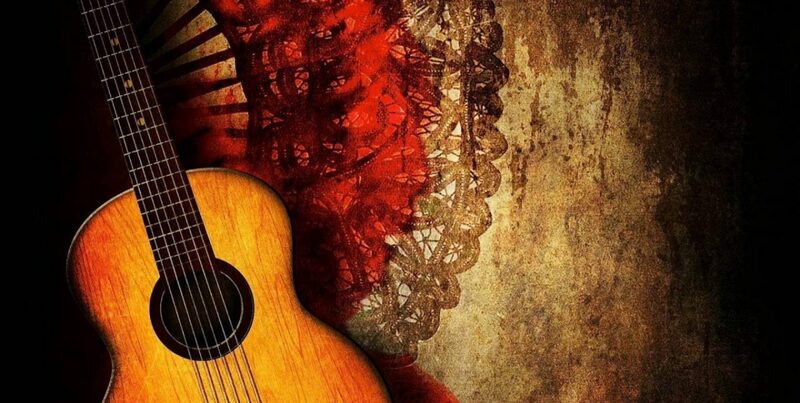 Not only that, they sometimes believe Flamenco is from Mexico, due to the Spanish influence in Mexico and the Southern states like Texas, California, and Arizona. We share our shows and presentations in different formats, social media, blogs, and videos, anything that can spread the word. Flamenco has a deep, beautiful history that should be explained, to eradicate the lack of cultural misunderstandings, racism, and discrimination. Therefore, we believe that it is important to let our friends and family members know what it is. The best part of understanding this dance format is so the people around us, including our families, learn a new dance. Being raised in Puerto Rico, I got really tired of Salsa and Merengue dances. I am not saying I don’t like Salsa and Merengue, it is just that it became a boring form of dance. Flamenco brought so much to me that now I feel special, no one in my family knows this dance form. Anyone can dance a Salsa or a Merengue, for they are not hard to learn, but not everyone can dance Flamenco, that is a whole different format that only the brave can master. Students of Pasion y Arte Flamenco practicing and performing on the Students Showcase, 2018. Doing what you love is magical, inexplicable, and talking about it shows how much you enjoy it. I admire people like my flamenco teacher, who work at something they love. They enjoy every moment of it, and they love sharing their knowledge with others. Their spirit comes out through their words, their patience, and their emphasis. I wish I learned Flamenco before, I think I would have dedicated myself also to teach this beautiful art. I believe there are other things we can do in life, and doing what you love is the best part of it. I can say I love Flamenco and enjoy sharing it with others. I share my story here to inspire you to do what you love, and share with others your craft. There is nothing more beautiful than sharing your knowledge and inspire others to do the same for the better good of humanity.